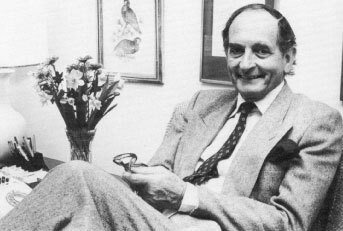 Graham Clutterbuck, founder and managing director of the FilmFair Group of companies, was responsible for bringing many popular animation series to our television screens, including Paddington, The Wombles, The Perishers, Parsley, The Herbs, Simon, Portland Bill, Moschops and The Blunders. This article is based on an interview conducted by David Jefferson. GRAHAM CLUTTERBUCK: I entered the film business purely by chance. I began my career as a trainee in what is now Saatchi and Saatchi, but in those days was called Garlands Advertising. This followed seven years war service from 1939 to 1945. I came out with the rank of Sergeant Major although everyone thinks I must have been a Colonel. I wanted to go into the theatre but my wife’s family of Italian aristocrats would not hear of jt. I did the next best thing, which all poets-manqué or actors-manqué do – they go into advertising. I was handling the Schweppes account at Garlands when the slogan ‘Schweppervescence lasts the whole drink through’ was created, back in 1946. My fellow trainee, Kenneth Gill, stayed with the agency through a number of takeovers and is now the chairman of Saatchi and Saatchi. I wish I had stayed put. From there I became General Manager of a company who manufacture products for the building trade, where I worked for the next seven years. Meanwhile, my wife, who was a talented artist, joined Halas and Batchelor as a tracer and painter when they were producing Animal Fatm. Later she joined the British branch of UPA, an American company headed by Leo Salkin. Eventually UPA folded and two of the American animators moved to France to work at Les Cinéastes Associes. When they heard the company was disappointed with the way its services were being sold in England, they told of an Englishman they knew who wore a bowler hat and seemed to be the epitome of the smooth front man. They were talking about me. I received a telephone call from Jaques Forgeot, head of Les Cinéastes Associés, who asked me to fly over to France to discuss a job in his company. I told him I hadn’t the slightest wish to leave my present position. He announced I could write my own contract. My wife took over and, of course, I went to see them. I found myself resigning from a steady job, where I had shares in the company, to take on a profession I knew nothing about. Jacques Forgeot was a millionaire and an entrepreneur in every sense of the word. Les Cinéastes Associés had on the team four great animators: Alexander Alexeieff, known for his pin-screen animation; Etienne Raik, one of the great middle European animators of models and special effects; and the Bettiol brothers, an Italian team who specialised in puppet animation. Forgeot wanted the best and he persuaded these experts to work on commercials by offering them a great deal of money. I was able to go to I. Walter Thompson’s in London, to Mather in Italy or to Young and Rubicam in Germany and say, “Look at our show reel, I’ve got Alexeieff, I’ve got Etienne Raik.” In those days, cinema commercials were very profitable. The money was made by selling thousands of prints. Companies like Pearl and Dean got very rich with bulk printing. They were great days and, please believe me, they were creative days, much more so than today, because the market research people had not yet put a stranglehold on the creativity. We won Festival awards for such commercials as ‘Omo adds brightness’. We were the first people to use Peter Sellars as a voice artist, this was for a ‘Kennomeat’ commercial. I remained with the company for ten years and was appointed Director General. The company became very powerful, however, the French decided that because I was British I was superfluous. They ganged up against me while I was away on business in New York. On my return I was called upstairs, on the carpet, and found myself out of a job. One of my New York associates was Gus Jekel. He had been an animator at Walt Disney, working on Snow White and the Seven Dwarfs. Later while working for another animation company he got the urge to expand into live action even though he was a fabulous cartoon animator. They would not give him the opportunity so he formed his own company to make commercials. That was the start of FilmFair in the U.S.A. He built up a huge business on such famous commercial series as Marlborough cigarettes, featuring modern cowboys. He made a great deal of money, branched out into colour laboratories, but always retained a very big cartoon unit in Los Angeles. They are the only people, apart from Walt Disney, permitted to do the Disney characters for commercials. Gus Jekel backed me with a small amount of money, to start the European branch of FilmFair. My contribution was my expertise as a producer of advertising commercials. While I was still at Les Cinéastes a man who originally worked for me as a junior assistant, Serge Danot, came to me and tried to sell the idea of The Magic Roundabout. I foolishly turned it down. Soon after I started FilmFair he phoned me up and invited me to see them shooting. That was where I met a skilful puppet animator, half French, half English called Ivor Wood. When he got to know me he decided I was the kind of businessman who would treat him fairly so he joined my company on the understanding that he was a partner in everything he created for us.